Boston Marriott Copley Place attracts both business and leisure travelers who love the hotel's upscale amenities, huge swimming pool, and excellent Back Bay location near downtown Boston, the Theatre District, and the South End. Once you stay at the Boston Marriott Copley Hotel and experience the convenience of staying in the fashionable Back Bay neighborhood, you'll understand why this hotel is a highly rated choice among Boston hotels. Business travelers, visiting families, and tourists seeking comfortable Boston hotel accommodations close to all of the city's attractions both the location and the amenities of the bustling Copley Place Marriott Hotel in Boston. With 1,100 rooms and 47 suites, the Boston Marriott Copley Place is also a favorite spot for business conferences, meetings, and conventions. It's also a favorite site for Boston weddings, wedding receptions, and anniversary parties. Three restaurants are on site, along with Champions Sports Bar, one of the best Boston sports bars for watching your home town games on big screen TVs. The Marriott Copley Place Hotel's great Back Bay location also means that dozens, probably hundreds of other the top Boston restaurants are within an easy walk. If you love to shop, you'll be in paradise here. The hotel is literally just steps away from two of the city's finest shopping centers - Copley Place and Prudential Center. In fact, the Boston Marriott Copley Hotel is actually part of the Copley Place complex. Fabulous Newbury Street shopping is equally convenient. Dedicated shoppers could spend weeks exploring all of the designer boutiques and art galleries along Newbury Street plus the bigger stores on Boylston! Unlike older Boston hotels where small rooms are the norm, the relatively new Marriott Copley Place features spacious rooms equipped with comfort items such as down comforters and down pillows. Some have terrific city views - request this if it's important to you. 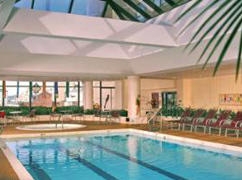 This Marriott also has one of the nicest indoor swimming pools in the city. It's the perfect place to relax after a busy day of business or shopping, and truly luxurious during Boston's long winter months. A well-equipped fitness room will also help you keep in shape. In addition to all of the nearby shopping, you're also close to many other attractions. Prudential Center, Copley Plaza, Fenway Park, the Theatre District, Hynes Convention Center, and Downtown Boston are within easy walking distance from the Boston Marriott Copley Hotel. Two blocks to the south of the hotel is the beautiful Southwest Corridor park, and Boston's trendy South End - with even more wonderful restaurants and shopping. The T (subway) stop near the hotel means that you can also easily get to other parts of the city from the Boston Marriott Copley Place. 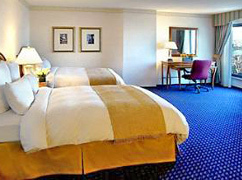 Although the Marriott Copley Place is an excellent hotel choice for leisure travelers, it primarily targets business visitors. That means during periods when business travel is slower, such as on weekends and at some times during the year, you may find very attractive rates here. from over 30 reservations sites for this popular hotel.